A fraction of pedestrian crossings have been upgraded in Edmonton in the past year or so while 22 of the top 70 riskiest crossings in the city still need attention. 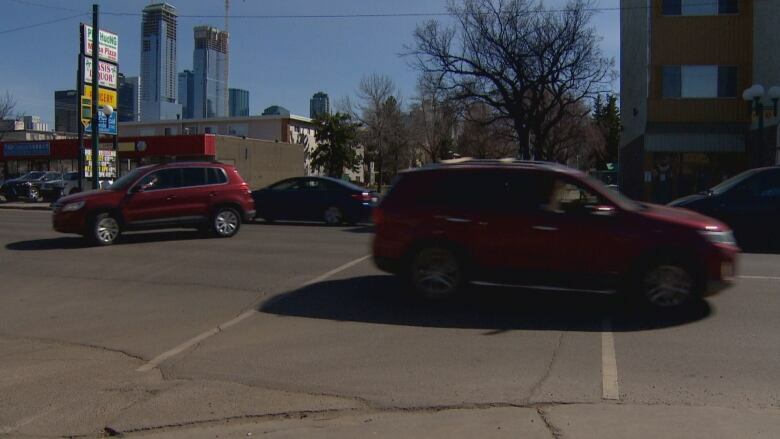 The City of Edmonton has a list of the most dangerous pedestrian crossings in the city, but only a fraction have been upgraded since the list was released last year. Twenty two crossings on the top 70 riskiest crosswalks in the city still need attention. The city has the $2.8 million needed to continue installing pedestrian signals at the 22 crossings. But the list identified an additional 589 — on top of the 70 — with an uncertain source of funding, according to a report in front of council on Tuesday. "There's a long way to go before we catch up on that list," Coun. Tim Cartmell said. "So I think we need to continue to migrate resources into this program and get these crossings constructed." Council will discuss the potential of reallocating money from the Traffic Safety and Automated Enforcement Reserve — commonly known as photo radar — to put directly toward crosswalk safety. Photo radar generates about $46.7 million a year, $22 million of which goes to the Edmonton police with the remainder used for traffic safety operations and community infrastructure and "corporate initiatives." The city has outlined three options: reallocating five per cent, ten per cent or a gradual reallocation of photo radar funds. Cartmell said he supports the idea. "Crosswalks and signals are key, in my view — the key — so I'm all in favour of migrating as much of our resources as we can to crosswalk installation." Some critical crosswalks have been installed, he said, but the city has had requests for crossings in many places. Cartmell said he gets complaints and concerns for the intersection at Rabbit Hill Road and Magrath Blvd, which currently is equipped with a yellow flashing light overhead. "But that is seemingly inadequate — we're having too many close calls at that intersection." President of the downtown community league, Chris Buyze, notes safety in some areas has improved, like the scramble crosswalk around Rogers Place. He suggests some pedestrian-oriented streets would benefit from a mid-block crossing, such as 104th Street between Jasper Avenue and 102nd Avenue. He'd also like to see a crosswalk on 100th Street to help pedestrians walk safely to the funicular next to the Hotel Macdonald. "Many people are crossing illegally there to get to the funicular and it's very dangerous and not friendly," Buyze said. Coun. Andrew Knack requested the crosswalk priority list in January 2018. "You name a community, I could probably name the location where we need at least one crosswalk right now," he said Monday. "It's why we're trying to say how can we best address all of these traffic safety concerns using the variety of tools and looking at it with the existing funding." Knack is also a proponent of lowering the speed limit on local residential roads to 30 km/h. At a community and public services committee meeting Mar. 20, councillors agreed to get the bylaw drafted on changing the limit to 40 km/h. The same day, council asked administration to come up with more detailed numbers for crosswalk safety projects, and report back in May with proposed adjustments to the 2019-2022 capital budget.